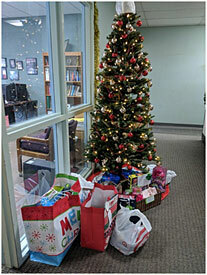 For the third consecutive year, AWT sponsored the Giving Tree this holiday season. This is a cause that is near and dear to our hearts, and especially one of our key managers, Mr. Rob Gaupp, who brought this opportunity into our office. Each employee selects a tag with the name and gender of a child who is less fortunate. On the card is a wish list of the types of gifts they would like to receive. The employees then purchase the gifts and place them under the tree, at which point Rob collects them and hand delivers them to the YMCA in his community. We are proud to support this and various other charitable causes.